Depending on the costume, Halloween necklaces and accessories can make a drastic improvement to your costume and a huge difference in your overall appearance on Halloween. It is truly amazing how much a carefully selected necklace can really enhance your outfit finishing touch. You may well surprise yourself when you look in the mirror. I love necklaces, so they are often my first accessory to don. Necklaces and pendants are probably my favorite pieces of jewelry. Perhaps, that is simply because your neck is naturally a lovely form for display. Or perhaps, it is because I have to use my hands so much when I am doing any type of work, even setting up for a party. Rings and bracelets tend to get in the way or they could even get damaged depending on the level of physical activity. Whatever the reason, necklaces are an extremely important element of my costume. The really can change the overall appearance or make a plain costume magnificent. There are so many beautifully designed Halloween necklaces that would be appropriate for costumes and parties. The costume featured above offers the perfect opportunity to adorn yourself with one of the following gorgeous creations in necklaces for Halloween. Imagine how much better that costume would look with the right Halloween necklace. Many of these necklaces or pendants will tempt you to wear them for other occasions as well so we don’t have to feel like our money is wasted on a Halloween accessory. Consider these Gothic style necklaces. Either of them would add beauty to the costume above or to your costume. The “Empress Eugenie’s Blue Heart Diamond” necklace or the “Queen of the Night” pendant necklace would be a stunning selection for a costume with a dropped neckline. The La Fleur de Baudelaire Gothic Choker (center) will accommodate just about any neckline in a costume. Truly a beautiful choice! These necklaces are beautiful with their lovely gems and ornate settings and they would be quit gorgeous with the right style of costume. However, we don’t always select “pretty” costumes for Halloween. Sometime we want to embrace the dark side. Perhaps even send a tinkle down the spine of anyone we encounter. The next set of Halloween necklaces are for the dark and dangerous costumes. 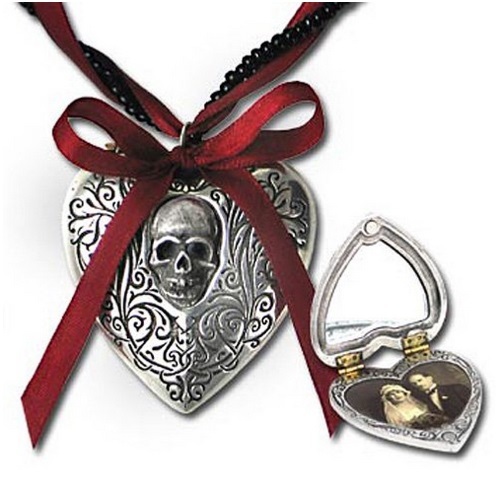 For that touch of red that makes the perfect accent piece for a Vampire costume, allow me to present the Coeur Sauvage Alchemy Gothic Necklace or the Bleeding Heart necklace. Either of these Halloween necklaces are sure to elicit many comments and compliments from your willing “victims”. The color and images with these necklaces could give a bit of a fright all on their own, but imagine them as the main jewelry selection for a creature of the night costume. I have placed these two necklaces here to consider wearing with Halloween costumes, but you may well be very surprised by how much you love them and want to wear them year round. Lockets are always beautiful and are often treasured keepsakes. These lockets would serve you well on Halloween, as well as on a daily basis. I could easily imagine the Orthodox Icon Locket being passed down from one generation to the next, but for now, let’s focus on Halloween. The Orthodox Icon Locket would be the perfect selection for the more conservative historical costumes such as the Victorian style, while the Reliquary Heart Locket has an old-fashioned conservative appeal until you look closely and see the skull. This locket necklace would be awesome with a ghost costume! The Absinthe Fairy Pendant Necklace is another necklace that requires one to look closely to see the demon locked within the stone. You almost don’t even notice the Swarovski crystal for being transfixed by the demon once you see him. I love the detail of this particular necklace. Each time I look at it, I notice something different. The Angel of Dore Pendant Necklace is a favorite for men as well as women. Perhaps that is because of his sheer size. He is 3.8 x 3.2 x 0.4 inches. He is not likely to be ignored or overlooked! The Chemical Wedding Alchemy Gothic Necklace reflects the union of angels & demons. The Wolverine Moon Alchemy Gothic Wolf Sword Necklace is a combination of beautiful and deadly, just like the wolf. This necklace would make the perfect finishing touch for a lot of different costumes. American Indian costumes may be the first to come to mind, but I could well imagine it with a viking or warrior costume as well. The combination of the moon, a dagger and the wolf results in a fabulously stunning necklace appropriate for Halloween or just for fun. You may note the nicks in the blade of the dagger. There were placed there intentionally to reference the many battles fought. This is another necklace that would be appropriate for either male or female. I hope you enjoyed perusing this collection of Halloween necklaces. They really are a lot of fun to wear and can certainly add the perfect finishing touch to your Halloween costume. But the very best attribute of all of these necklaces is that they can also be worn for other occasions and parties, not just Halloween. Some would even be appropriate for daily wear. Just make sure you wear them in front of your friends for the first time on Halloween. You want to get the full shock value from them.